The 74HC1G00 and 74HCT1G00 are high speed Si-gate CMOS devices. They provide a 2-input NAND function. The HC device has CMOS input switching levels and supply voltage range 2 V to 6 V. The HCT device has TTL input switching levels and supply voltage range 4.5 V to 5.5 V. The standard output currents are half those of the 74HC00 and 74HCT00. This is one package pinout of 74HC1G00,If you need more pinouts please download 74HC1G00's pdf datasheet. 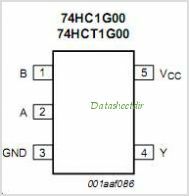 74HC1G00 circuits will be updated soon..., now you can download the pdf datasheet to check the circuits!